How do we pick our readings? In today’s Gospel, Mark tells two of Jesus’ healing miracles, one nested within the other. The bookends, as it were, concern a synagogue leader Jairus, whose daughter was deathly ill; the meat in the sandwich is the healing of a woman who had suffered from bleeding of many years. Both stories bring out the question of faith as part of healing. The woman was so convinced that Jesus can cure her that she did not even need to speak to Jesus or have him lay hands on her personally; just to touch his clothing was enough. There’s no doubt that having a positive outcome can be helpful towards recovery from an illness or injury. People who give up hope do not seem to last long. Something that struck me when I read the passage this week was that the woman must have kept her illness secret, because bleeding would have made her ritually unclean. If people in the crowd had known about her illness, she would have been shunned and excluded from the group listening to Jesus. I have spoken on this passage before at St. George’s, and do not have much to say that is new. So I am going to use the opportunity to talk about a question that has been asked of me many times at St. George’s. “Where do the readings come from that we use on Sundays, and why do we use them?” The short answer is that they come from the Revised Common Lectionary, which is the ongoing work of an international committee that began after the Roman Catholic Vatican II. 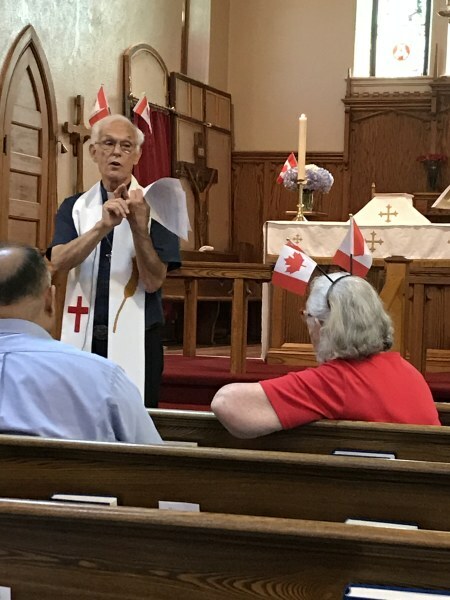 Almost all Anglican, United, Lutheran, and Presbyterian churches in Canada also follow the RCL, as do the corresponding denominations in many other countries, so you would have heard today’s reading from Mark’s Gospel in any of the above-mentioned churches, and even in some less liturgical churches. The Revised Common Lectionary is based on a three-year cycle, Years A, B, and C, in the course of which we read through the majority of the most important Bible stories. Every week, the following are appointed: an Old Testament reading, a psalm, a non-Gospel New Testament reading (most often from Paul’s letters), and a Gospel. The Gospel in Year A is mostly Matthew, Year B (this year) is Mark, and Year C is Luke. John’s Gospel is interspersed among the three years; this year we get a lot of John because Mark’s Gospel is shorter than Matthew or Luke. Many churches (e.g., Grace Church Milton) use all three Bible readings and the psalm every week. At. St. George’s, we use only two plus the psalm. Between the Old Testament and the Epistle, I try to choose the more interesting one, especially because many Epistle readings do not stand well alone. Paul’s arguments were often complex, and snippets taken out of context can be very hard to understand. There are two versions of the Old Testament readings. One tries to pick passages that complement the day’s Gospel; the Anglican Church of Canada uses the ‘semi-continuous’ version. At the moment, in Year B, we are reading from the books of Samuel, from which we hear some of the most significant stories about King David. The Epistle passages at the moment are a semi-continuous reading of Paul’s second letter to the church in Corinth. I see two arguments in favour of using the RCL. First, as implied already, regular churchgoers get a good overview of the Bible in each three-year cycle. The second argument is even more important. If the preacher chooses his or her own Scripture, the congregation will get a rehash of the preacher’s favourite texts and themes. For example, ‘Hell and Damnation’ preachers use a lot of Exodus, Leviticus, and Revelation as texts. The RCL forces me to preach on passages that I find difficult, so I have to spend time deciding how to present them. Some of them I don’t even like or agree with, but I am forced to come to grips with them. As has been said, the lectionary protects the congregation from their pastor! The RCL is not perfect, however, especially for Sunday-only congregations, small parishes like this one. That’s because some of the readings are appointed for specific days in the church calendar that do not necessarily fall on Sundays. For example, Matthew’s account of the slaughter of the baby boys by King Herod after the Wise Men tricked him is appointed for January 11, so it only read in a parish like ours if January 11 in Year A happens to fall on a Sunday (on average, every 21 years!). You may recall that last year, I obtained permission from Bishop Michael to change the whole Gospel series of the Epiphany readings to accommodate that reading, among others. The international committee that looks after the lectionary considers changes from time to time. At the clergy conference this year, I spoke with Peter Wall, the Dean of our Cathedral, who is involved with a local group called Liturgy Canada. One reason for using today’s homily to talk to you on this subject is that Peter encouraged me to write down my concerns, which he will forward to the English language section of the committee that prepares the RCL. My main concern with the details (not the concept) of the RCL is that it is often unhelpful to understanding the overall “story of Jesus” presented in the Gospels. Broadly speaking, the lectionary year falls into two parts. Advent to Pentecost is a quick overview of the life, death, and resurrection of Jesus Christ. Jesus’ parables, miracles, and teaching are studied in more detail in the period between Pentecost and the Reign of Christ at the end of November. Most of the problems arise in the first part of the year, Advent to Pentecost. Only Luke recorded events that lead up to Christmas. Matthew and Mark have no appropriate material, and we continue with the ‘end of the age’ passages that look forward, not to Jesus’ birth, but to a Second Coming and a final Judgement Day. Worse, they are completely misleading in having John’s prediction of the coming Messiah appear in Advent: John and Jesus were contemporaries, so this prediction is 30 years too early. Another problem arises after Christmas. Epiphany is always January 6, twelve days after Christmas, and the Baptism of Our Lord is fixed as the Sunday after Epiphany. The leaves no time for reading about either the Holy Innocents and the escape to Egypt (Matthew), or about the Presentation of Jesus to Simeon in the Temple(Luke). Worse, the Temptation of Jesus in the wilderness is deferred to the first Sunday of Lent. This makes nonsense of the story: Jesus retired to the wilderness after his baptism as a sort of post baptism retreat, not to prepare himself for his journey to Jerusalem and ultimate crucifixion. A more minor problem comes up in August this year, when the Feeding of the Five Thousand is followed by John’s Bread of Life discourse for four straight weeks. I can’t imagine what I could say for four weeks running on the same subject! I admit it; I am going to cheat. These five weeks will begin with a passage from Mark that we would otherwise omit, then the Feeding of the Five Thousand. Luckily the Feast day of St. Mary the Virgin falls in August (though not on Sunday this year). That leaves two Sundays for the Bread of Life; I will preach one and Jan will preach the other. In short, the RCL is an excellent system, despite my quibbles and complaints about parts of it. I am still working on my complete list of ideas to make it more congregation-friendly. Your ideas are welcome!